This view shows the thin crescent Moon setting over ESO’s Paranal Observatory in Chile. As well as the bright crescent the rest of the disc of the Moon can be faintly seen. This phenomenon is called earthshine. It is due to sunlight reflecting off the Earth and illuminating the lunar surface. By observing earthshine astronomers can study the properties of light reflected from Earth as if it were an exoplanet and search for signs of life. 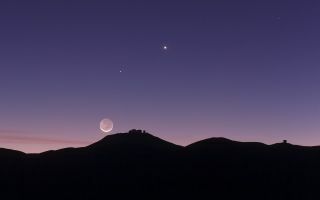 This picture was taken on 27 October 2011 and also records the planets Mercury and Venus. In this space wallpaper, sunlight reflects off the Earth and shines upon the moon, gaining the name "earthshine." This view shows a crescent moon setting over ESO's Paranal Observatory in Chile, illuminated mostly by earthshine. The photo was taken on 27 October 2011, and also shows Mercury and Venus.